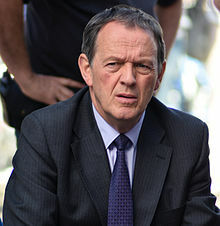 Kevin Whately (born 6 February 1951) is an English actor. Whately is primarily known for his role as Robert "Robbie" Lewis in the crime dramas Inspector Morse from 1987-2000 and Lewis from 2005-2015, his role as Neville "Nev" Hope in the British television comedy Auf Wiedersehen, Pet, and his role as Jack Kerruish in the drama series Peak Practice, although he has appeared in numerous other roles. Whately is from Humshaugh, near Hexham, Northumberland. His mother, Mary (née Pickering), was a teacher and his father, Richard, was a Commander in the Royal Navy. His maternal grandmother, Doris Phillips, was a professional concert singer and his great-great-grandfather, Richard Whately, was Anglican Archbishop of Dublin. The BBC documentary Who Do You Think You Are?, broadcast on 2 March 2009, also revealed that Whately is a descendant, on his paternal side, of Thomas Whately of Nonsuch Park (father of Thomas Whately), a leading London merchant, English politician and writer who became a director of the Bank of England, and of Major Robert Thompson, a pioneer tobacco plantation owner in Virginia who was a staunch supporter of the Parliamentarian cause at the time of the English Commonwealth. Whately was educated at Barnard Castle School, and went on to study drama at the Central School of Speech and Drama in 1975. Before going professional, Whately was an amateur actor at the People's Theatre in Newcastle upon Tyne during the 1970s. His brother, Frank, is a lecturer at Kingston University in London. Before turning to professional acting, Whately began his working life as a folk singer, and still plays the guitar, performing for charity concerts. Along with other Auf Wiedersehen, Pet stars, he makes an appearance at the biennial benefit concert Sunday for Sammy in Newcastle. Before becoming an actor, he started training as an accountant. His acting career includes several stage plays, among them an adaptation of Twelve Angry Men, and film appearances in The Return of the Soldier, The English Patient, Paranoid and Purely Belter. Whately's television appearances include episodes of Shoestring, Angels, Juliet Bravo, Strangers, Coronation Street, Auf Wiedersehen Pet, Alas Smith and Jones, Look and Read, You Must Be The Husband, B&B, Peak Practice, Skallagrigg, The Broker's Man, Murder in Mind, Inspector Morse, 2003 Comic Relief Auf Wiedersehen Pet, Lewis, New Tricks, Who Gets the Dog?, The Children and Silent Cry. Whately provided one of the voices for the English-language version of the 1999 claymation Children's television series Hilltop Hospital. He has also done voiceovers for a WaterAid advertisement. In 1985, Whately appeared in a 3-part Miss Marple adaptation ("A Murder Is Announced") for the BBC. His part, Detective Sergeant Fletcher, opposite John Castle as Inspector Craddock, was very similar to what became the career-defining role he took two years later, when he was cast as Detective Sergeant Lewis, the down-to-earth complement to the eponymous Inspector Morse played by John Thaw. Whately starred opposite Thaw in 32 episodes over 13 years in the hugely successful series that established him as a household name in the UK. He reprised the role in the spin-off series Lewis, in which Lewis returns to Oxford as a full Inspector. With his new partner, the Cambridge-educated Detective Sergeant James Hathaway (Laurence Fox), Inspector Lewis solves murder mysteries while trying to rebuild his life after his wife's sudden death in a hit-and-run accident and to gain recognition from his sceptical new boss. Richard Marson's book celebrating fifty years of Blue Peter comments that Whately auditioned as a presenter for the show in 1980 but lost out to Peter Duncan. In 2010 Whately played the lead in the television film Joe Maddison's War about strained family and social relations in wartime. Directed by Patrick Collerton, it presented a view of World War II through the eyes of shipyard worker and World War I veteran Joe Maddison (Kevin Whately) who serves in the Home Guard during the Blitz. Following the filming of the seventh series of Lewis, at the end of 2012, Whately and Laurence Fox announced that they would take a break of at least a year before filming more episodes. ITV indicated a continuing commitment to the series and that they wished to produce additional episodes of the programme. On 4 November 2012 Whately performed in a radio drama on BBC3 called The Torchbearers, which follows the circumstances of several UK citizens whose lives are changed through contact with the Olympic Torch. In 2013, Newcastle upon Tyne's Live Theatre produced a series of performances of the unique, acclaimed one-person play, White Rabbit, Red Rabbit, which is enacted as a cold reading with no sets or costumes by a different performer each night. Whately was the actor for the sold-out performance of 10 March 2013. After the end of 9th and final series of Lewis Whately announced he was to retire from acting after playing Lewis on and off for 28 years. Whately was the patron of the Central School of Speech and Drama Full House Theatre Company for 2011. Whately lives in Woburn Sands near Milton Keynes with his wife actress Madelaine Newton, who starred in the 1970s BBC drama When the Boat Comes In. Madelaine starred as Morse's love interest in the Inspector Morse episode entitled Masonic Mysteries (1990; series 4, episode 4). Whately enjoys rock music and plays the guitar; he has cited Pink Floyd and Dire Straits as bands he has particularly enjoyed. He is a fan of Newcastle United on the football field, but says that he likes rugby league better, and as a cricketer admitted to Inspector Morse writer Colin Dexter that he would like to have played cricket professionally for England. Dexter devised the storyline for the Inspector Morse episode "Deceived by Flight" (1989; series 3, episode 3) in which Sergeant Lewis had to go undercover in a cricket team to investigate drug smuggling. In August 2014, Whately was one of 200 public figures who were signatories to a letter to The Guardian expressing their hope that Scotland would vote to remain part of the United Kingdom in September's referendum on that issue. 1979 Shoestring Bobby Treen Episode: "The Partnership"
1980 BBC2 Playhouse Bob Smith Episode: "The Dig"
Juliet Bravo PC Chris Evans Episode: "Coming Back"
Strangers Michael Hobb Episode: "Retribution"
1983 Shackleton Jameson Adams Episode: "Our Dead Bodies Must Tell the Tale"
You Must Be the Husband Hugo Mansell Episode: "A Bit Prickly in the Morning"
1990 Screenplay Neil Baldwin Episode: "Night Voice"
1994 Screen Two Sam Hopkins Episode: "Skallagrigg"
Q.E.D. Narrator Episode: "Food Fights"
Light Lunch Himself Episode: "Ooh Doctor, I Feel a Bit Peaky"
Episode: "Gracey Greyshell's Last Day"
2001 Murder in Mind Nigel Liddy Episode: "Neighbours"
Bible Mysteries Narrator Episode: "David and Goliath"
Drama Connections Himself Episode: "Auf Wiedersehen, Pet"
New Tricks Andrew Simson Episode: "Congratulations"
Inspector George Gently Donald McGhee Episode: "Gently in the Cathedral"
2016 Pointless Celebrities Himself Episode: "Law and Order"
Still Game Cameron Hastie Episode: "Job"
^ Marriage Index. April 1984. Aylesbury. Vol 19. Page 1137. ^ "Hexham actor digs deep to discover a privileged past". JournalLive. 2 March 2009. Retrieved 8 March 2009. ^ "Index entry". FreeBMD. ONS. Retrieved 24 May 2010. ^ a b c d e f g "Kevin Whately". Who Do You Think You Are?. Season six. Episode five. 2 March 2009. BBC One. ^ "BBC Who Do You Think You Are?". BBC. 2009. Retrieved 8 March 2009. ^ "Drama". Barnard Castle School website. Retrieved 8 March 2009. ^ "High Profile Alumni". cssd.ac.uk. The Royal Central School of Speech and Drama. Retrieved 7 July 2016. ^ "BBC Radio 3 – Drama on 3, The Torchbearers". Bbc.co.uk. 4 November 2012. Retrieved 26 August 2014. ^ "Full House Theatre Company" (Adobe Acrobat *.PDF). The Alumni Newsletter. Central School of Speech and Drama, University of London (17). August 2011. Retrieved 23 December 2011. ^ a b "KEVIN WHATELY" (PDF). CDA Theatrical Agency. November 2015. Retrieved 21 February 2019. ^ "Kevin Whately and Angela Griffin to lead cast in Arthur by Ben Weatherill as part of the Pitch Your Play at the Theatre Royal Haymarket" (PDF). Masterclass. 30 November 2015. Retrieved 21 February 2019. This page was last edited on 7 March 2019, at 15:09 (UTC).